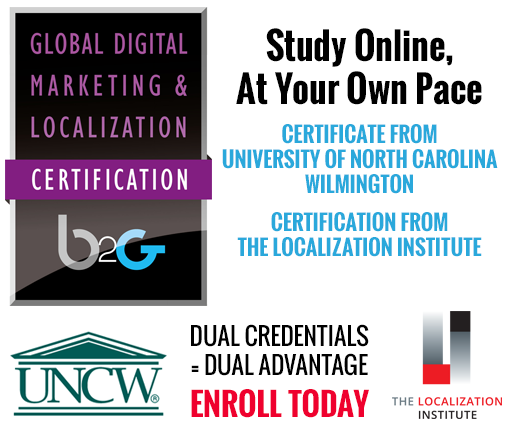 In only a few short years, the Global Digital Marketing and Localization Certification has been taken by students in over 14 different countries. Below you will find select feedback and comments from some previous students of the program. Do not hesitate to contact us if you have specific questions about this program. “I have been enjoying your Global Digital Marketing & Localization course. I work in the marketing group for a mid-size B2B manufacturing company that has regional offices in Europe, Asia, North and South America.The Global Digital Marketing & Localization Certificate program is insightful and has made me evaluate the decisions influencing the global impact of our website." "I have enjoyed the visuals, all of the modules have kept my attention, and I have learned a lot." "[I]t was absolutely interesting and helpful when it comes to gain a better understanding of localization trends in today's global and digital environment - thanks for giving a consistent and complete learning path to such a complex subject! I will recommend my colleagues to register as well!" "I have nothing but positive feedback for the course. I thought it very thorough yet focused on broader aspects of digital marketing and localization that helped me to understand concepts and real-life application. I like the flexibility of the course as well as I was working full time while completing the course." Mandi Ciocca	Head of Consulting for Improove, Inc.
"[I] wanted to thank you for the insight and lectures through the Global Digital Marketing course. It is so difficult to find information like this in the field of localization and I appreciate the thoroughness in the understanding and definitions to the concepts. " "I’ve finished all the modules and I must confess I enjoyed every bit of it." "I would like to thank you for the wonderful e modules, and the simple presentation style. The modules were very informative and helpful." "Let me start by saying: thank you, dear Professor! I have simply LOVED listening to the modules, from the topics, via the literature, to your terrific interviews done with many of our common friends from the L10n industry. Great stuff! The endlessly complex aspects to consider within L10n never cease to fascinate me." "I really enjoyed the course and it has helped me strategically approach localization for my campaigns in a whole new way"
"I heard about the certificate on Twitter and knew immediately that I needed to enroll, because it seemed to bring together all the disparate pieces of knowledge needed for global communications. I've worked in technical communication for over 15 years, so I'm somewhat familiar with creating content for international users. When I started, localization as a discipline was still in its infancy, so I had to self educate to learn about how source content impacts translation quality, how to write for global audiences, the use of colors/icons in UI, etc. So far I'm very pleased with the certificate, because it's helping to connect the dots between content, marketing, language, culture, business -- all the disciplines needed for successful internationalization." "As far as the content was concerned, I thought it was really great. I could see the detail and preparation that went into each class, and the organization and structure of the classes went perfectly with our in-class lectures and class project. My favorite part were the high-profile executives that you interviewed during the online sessions. They’re first-hand experience with running and developing online, international content and engaging international customers was very valuable." "[I] am enjoying the content. Your experience and knowledge clearly runs deep and is quite broad. Very impressive." Kris Kieper	VP of Client Services - Aware Web Solutions, Inc.
“I have thoroughly enjoyed the content of the Global Digital Marketing and Localization Certification course over the past couple of months; both the video lectures and the interviews with practitioners in different fields and industries have provided me with plenty of insights and ideas. I think that the curriculum for this course has been very well thought out and that it does not only provide students with theoretical tools and practical examples but also encourages them to further research and investigate the complex topics approached in the lectures. Last but not least, it has offered me actionable insights which I am now ready to apply in my day-to-day work."